Many of these pieces are now available to buy from the Design@44 shop, Sadler Gate, Derby. Contact me or the shop direct if there’s a piece you’re interested in purchasing. I’m happy to take commissions for specific pieces if you have a particular colour combination or idea you’d like creating. I can use up to size A3 paper. Please use the contact page for any requests. Patchwork Sea is an opulent piece on A4 Yupo paper, mounted and framed. Featuring my favourite sea colours with splashes of rich gold, this can be displayed portrait or landscape as preferred. Lavish is a sister piece to another painting I sold to a friend – this colour combination of rich purple, blue & gold proved very popular! It’s a mounted & framed piece on A5 Yupo paper. Aqua Splashes this piece uses softer colours from a more restricted palette and bubbly movement suggesting under sea currents. A5 Yupo paper. Flutterby / Pastel Drips are smaller framed pictures on A6 Yupo paper. 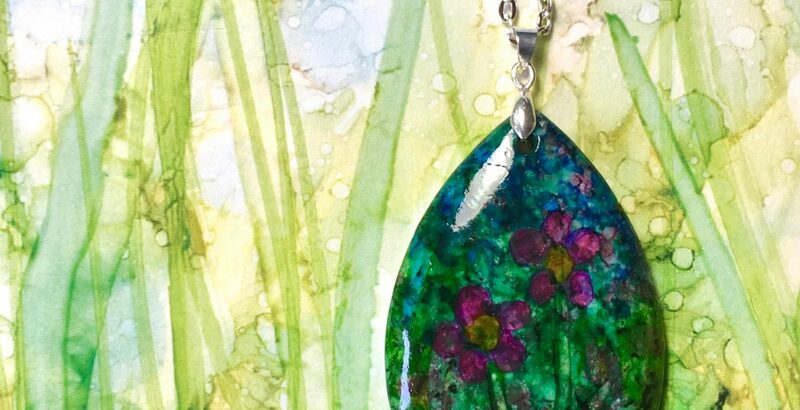 Tropical – I felt this piece was so juicy and luscious it had to be called tropical! On A5 Yupo paper. Fiesta – such a fiery bold statement! I felt my husband’s gorgeous red suede crepes set it off to perfection! On A5 Yupo paper.